So my previous post herewas regarding life in army, and I was going to post the 2nd part of it but it has been incredibly delayed due to me largely being inefficient in penning out what I want to write. So this is another post where the content is still fresh in my head so might as well type it out first! Besides, talking about army-related stuff can bring in much anger and angst so might as well write something happy, and SNSD has never failed to liven up the gloomy mood I experience these days! Prelude a few months before the concert, RITS released the information regarding the concert and that it was going to be a one-night only. 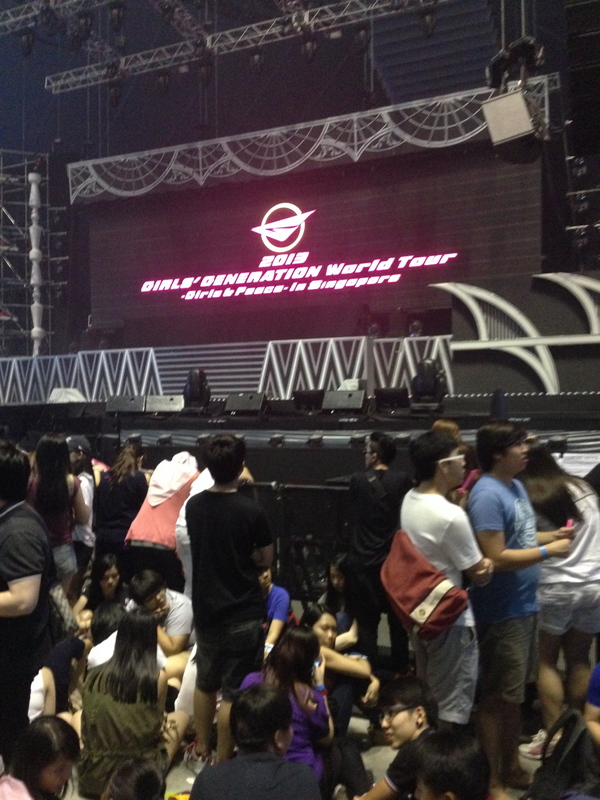 The SONE in me has died down quite a bit as the years pass by so it wasn’t a super MUST to go to the concert. I haven’t been in contact with the people I went to concert the previous time (the NPCC/Guitar guys), the tickets were almost half my army allowance in a month, and moshpit wasn’t attractive since I would have to burn the whole day to queue up, and weekend time is always precious when you’re still an army boy. But nonetheless, it’s FREAKING SNSD coming to Singapore again for a full concert, and I always tell my yolo so I decided to go for it. I have always been waiting for a full concert here, and teased myself by going SMTown last year, watching a few of their performances. For this time, I found 2 of my close army friends, James and Sylvester (whom are both Taeyeon-biased), and probably the only SONES willing enough to go to the concert. The previous time it was me who got the tickets, but since I was at Thailand for an exercise, sly got his mom’s Carlo Rino bag and managed to get us moshpit tickets, so BAM we are all set to go. Sly nearly got confined during the weekend of the concert due to MP raid, but fortunately for him his confinement period was before the concert. Although I wasn’t as excited as before, it was something I looked forward to quite a while as the year comes to a close and no other way better to celebrate by seeing the 9 girls live again! Onto concert day itself, I meet up with James at Stadium MRT and when we thought we arrived relatively earlier already, a freaking long queue leading to the second level outside the stadium is formed. The security is much tighter and orderly as compared to the previous time, and it was quite shocking to see so many SONEs arriving earlier than us. We reserved a slot for sly who came later due to his frisbee competition, went to buy lunch and stoned all the way till concert time. Everyone was very passive while waiting in queue: the people around us were all studying, one studying his notes while another brought his laptop to do his work. The female SONEs were more enthusiastic, giving out free banners and instructions on what to do for some songs, as well as letting us write messages on big plastic balls which were attempted to be thrown to them. For us three, we were really just stoning on our phones till we were told to move inside the moshpit, and it was quite torturous to wait as time passes and I dozed off for a while since I woke up early in the morning. After being orderly ushered into the moshpit, this is when you start to feel the hype and energy within the stadium arena. The wait inside felt much shorter as time creeped by slowly to the golden 6pm. After a slight delay, the stadium darkens and it’s show time for the girls! I positioned myself on the right side at the front of the moshpit, and I was able to get a close look of the girls for most of the concert. Seeing them up close makes all that waiting in the queue worth it, as it is really a different experience standing a few meters away from them as opposed to watching them from the seats. They really look like 9 angels as the light shines of them, and their legs… up close they look really skinny but flawless! During some songs they were performing the middle of the stage and I’m resorted to seeing just their backs. Still, it’s interesting to see some of the performances from the back view as you get to see the girls when they have their backs faced at some portion of the songs, such as Hoot and I Got A Boy. I spoiler-ed myself by looking up the concert playlist, but it helped get me familiar with some of the Japanese songs which I haven’t heard before. A week before the concert, I basically put all the songs into a playlist and listened to them continuously and it definitely helped! I was doing my fan chants diligently, and singing along all my favorite songs. Of course, how can I not love the moment I hear Tiffany says: “Singapore, put in back on!”. Tiffany, Seohyun and Sooyoung interacted with the crowd a lot, with Tiffany providing much fan service, flashing eye smiles and waves to everyone. During one of the songs where the large plastic balls were being passed around, Seohyun managed to grab one but dropped it down the stage, the shocked expression of her face and Tiffany’s face was like “OMG! !” was too cute! *fanboys* A pity Taeyeon wasn’t that active and constantly not at our side of the moshpit (to the dismay of my two poor friends HAHA). After each segment ended, the backstage crew had to go clean the stage, prepare any props for the next performance and prepare refreshments, which shows it isn’t easy working for such a large scale concert. The most enjoyable parts of the concert were the songs which were performed on an acoustic/acapella setting, which displayed their voices brilliantly, such as Forever and Baby Baby. The first song for the encore, where they started off with an acapella version of Into The New World, omg goosebumps everywhere. The energy throughout the songs wasn’t as strong as the concert 2 years back, but I give the girls the benefit of the doubt that they are tired from all of their schedules. You could tell that some of them were really tired, especially the kick during ITNW where it wasn’t as explosive as it was when they debuted, but hey no complains they put up an excellent concert! That’s the end of another concert, and 2 more months till the year 2013 comes to an end. Will try to keep those posts rolling in, but after all of the above, shall keep this in mind: Once a SONE, forever a SONE. In the future when I head back to studying in university, I definitely won’t have the time to fanboy, and even now the fanboy side has died down really a lot compared to the past. Now getting older, it’s time to put the fanboy side behind, and unleash it during the next concert. BEWARE! Right now, it’s Girl’s Generation. Tomorrow, it’s Girls Generation. Forever, it’s Girl Generation!